The Martyr Cat. Much controversy surrounds the history of this breed, which gained recognition in the USA in the 1960's. The charm of a Ragdoll is said to lie in the fact that it will flop in your arms when handled, but this is not uncommon in any cat that trusts its owner. The first Ragdoll kittens are said to have been born in California to a white Persian queen who had mismated, and after suffering a broken pelvis in a car accident, gave birth to a litter of kittens that flopped when handled. This would be genetically impossible, as the result of a road accident cannot cause the cat's genetic make-up to be changed and so be passed on to future generations. The truth of the Ragdoll's background is open to speculation. 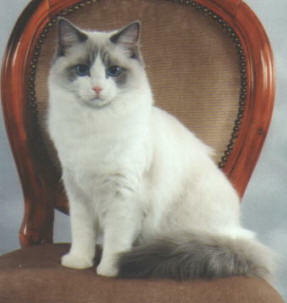 Looking at the varieties of Ragdoll accepted today, it is likely that the breed has an ancestry linked with Siamese, Colourpoints or Birmans. The Ragdoll is probably one of the most laid-back of all breeds of domesticated cats. It is relatively undemanding, very tolerant of most situations, and is gentle and relaxed. It is said that these cats have a lower pain threshold than most, but it is a debatable point, and certainly not one that should be tested. Remember: Ragdoll cats are too trusting, they must be kept as indoor cats only. Well known for its loving and adaptable nature, the Ragdoll quickly becomes attached to its owner. It is gentle, intelligent and even-tempered. Adult Ragdoll cats should be groomed at least twice per week. Ragdoll cats shed considerably less than other large, medium-long haired cats, but they still shed. Ragdolls grow, grow, and keep growing! A male Ragdoll cat can weigh up to 30 pounds when fully grown, although most Ragdolls reach about 10 pounds less than that . . . with females coming in at about 5-10 pounds less than males. Being a large cat, you will need a good-sized litterbox to accommodate your adult Ragdoll. And, you will need to keep it clean on a daily basis. Ragdoll cats need your love and attention more than any other breed. These cats thrive on affection. Ragdolls exist in three distinct colour patterns: Seal point, Blue mitted and Seal bicolour. Seal points are a cream colour with brown on the body, face, ears, feet and tail. Blue mitted are cream with blue-grey colour on the tail, face, ears and lower legs with distinct white boots. Seal bicolours mix brown on the upper body with white on the lower body and face. The Ragdoll's colour, as with all colourpointed cats, is not fully developed until it is about two years old, and the cat continues to grow until it is about four years old.